The fear of doom is haunting the fair elven forest. An ancient enemy, dark and sinister, is threatening them once more. Three witches inhabit the ruins of the wizard Elyas' tower, and their evil schemes are now in motion. Two elf maidens have disappeared without trace. None of those sent to explore the witches' tower have returned. The elves' magic is failing, and they have turned to you for help. You must enter the tower, discover its secrets, and defeat the evil of the witches forever. Are you equal to the challenge? 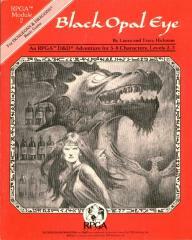 Black Opal Eye is a complete D&D Basic adventure for a balanced party of 5-8 adventurers, levels 2-3. It can be played on its own or as a sequel to RPGA Module 1. Black Opal Eye includes background information, maps of the tower, and detailed encounter information for the DM.